Wool Flocking also available at additional charge. 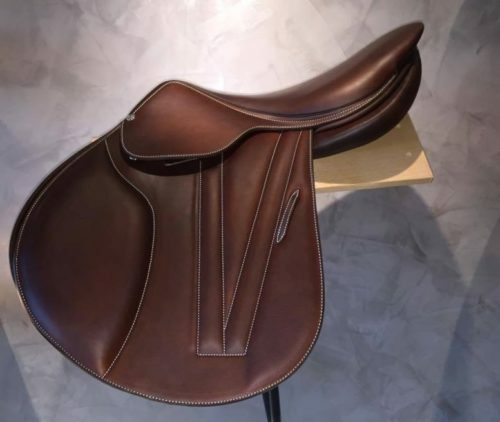 Handmade by the Butet workshop in Saumur, France, this beautiful dressage saddle is available in a single flap or double flap version and offers both horse and rider the ultimate in comfort and support. 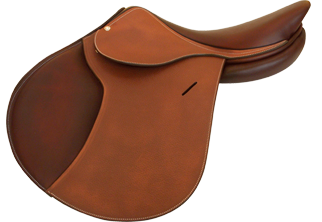 This saddle is the newest in the dressage collection. 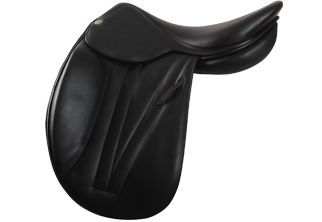 It is the deeper of the dressage saddles and is ideal for the rider who likes the support that a deep seat offers. The balance of the saddle creates an unparalleled close contact between rider and horse and enables the rider to assume a position that is both effective and comfortable. The latest model has been updated with ergonomic flaps and the addition of bespoke knee blocks which can be made to suit each individual rider. As with all Butet saddles, the materials used are second to none. The leather used is soft and supple and yet also tremendously hardwearing. The latex injected panels heat up with the horse’s body heat and mould to the shape of the horse.